Forget about the old misconception that fundraising is like „shaking a tin cup“ at donors. 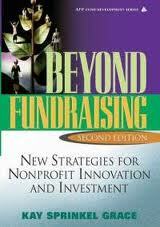 Beyond Fundraising: New Strategies for Nonprofit Innovation and Investment is a landmark book, a decade in the making! Written by world-renowned fundraising expert Kay Sprinkel Grace, it presents her core beliefs, principles, and strategies for developing long-term relationships with donor-investors and volunteers. Boards of trustees, non-board volunteers, and staff members from hundreds of nonprofit organizations in the United States, Canada, Australia, the United Kingdom, and western Europe have all taken something away from Kay’s workshops. Now, Kay brings the insight of her signature seminars to you. Beyond Fundraising: New Strategies for Nonprofit Innovation and Investment, Second Edition is the essential guide for everyone who wants to bring innovation and investment to their communities!